The town had probably developed within the cathedral area. The Cathedral was dedicated first to S. Maria. 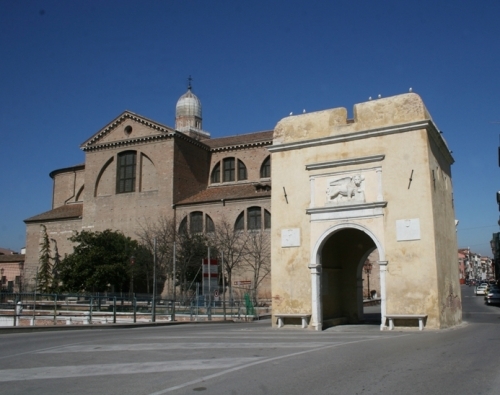 Its building dates back to 1100, age in which was moved the Episcopal seat within this area from Malamocco (that is the Matemaucus of the roman age, presumably the port of Padua, which was seat of the Dogi between 742 and 811, destroyed by the 1106-07 submarine earthquake). In the same place there had been a church since the year 1000. The structure and orientation which we now see was decided by Baldassarre Longhena (1598-1682), mighty architect of the `600, who had also built the church "Chiesa della Salute" in Venice. He carried out works for the re-construction after the 1623 fire, maintaining the many different traces and styles from the different ages. On the right side it is possible to see fifteenth-century statues and against the left side there is a fountain with decorative elements coming from the primitive building and a sarcophagus which dates back to the 1474. Above the entrance hall of the bell tower, in Romanesque style, there is a bas-relief which dates back to 1300. The inside, with a nave and two sails, is decorated with a plenty of masterpieces, such as for example the sculptures and the Carrara marble pulpit of Bartolomeo Cavalieri (1677), the baptistery, work of A. Cattajapietra, the high altar, work of Tremignon, the paintings of Andrea Vicentino (1593), Francesco Rosa (1685), Alvise dal Friso (1593), Pietro Malombra (1598) and many others. Among the most important works there is a Madonna con Bambino of Cima da Conegliano. On the door there is a bas-relief, called la Madonna del Riposo, which recall the permanence in Chioggia of Pope Alessandro III in 1177 on his way to Venice to meet Federico Barbarossa in order to sign the peace treaty between Empire and Papacy. The cathedral is now dedicated to the Saints Felice and Fortunato, whose relics are in a side chapel. On the walls of the chapel there are remarkable paintings, the works of Palma Il Giovane, Piazzetta, Tiepolo, Cignaroli, Diziani and Liberi.